Seemingly a warm-weather duck, the blue-winged teal is largely absent from most of North America in the cold months, and winters more extensively in South America than any of our other dabblers. Small groups of blue-wings often are seen standing on stumps or rocks at the water's edge. Populations apparently stable. Most blue-wings winter south of the U.S., so management requires cooperation with Latin American nations. dabbling duck. 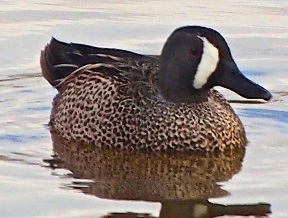 Teals are small ducks, fast in flight, with flocks twisting and turning in unison. The adult male has a greyish blue head with a white facial crescent, a light brown body with a white patch near the rear and a black tail. The adult female is mottled brown, and has a whitish area at base of bill. Both sexes have sky-blue wing coverts, a green speculum, and yellow legs. They have two molts per year and a third molt in their first year. The call of the male is a short whistle; the female's call is a soft quack. Habitat is on fresh water ponds, and marshes. In summer they can be found on shallow freshwater marshes and ponds in open country, and also on brackish marshes near the coast. In migration and winter they can be seen on any kind of shallow waters, inland or coastal. Flocks in migration are sometimes seen over the ocean, many miles offshore. 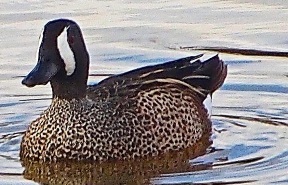 Blue-winged teals forage in very shallow water, gleaning items from the surface or swimming forward with their heads partly submerged. Diet is mostly plant material, especially seeds of various grasses, sedges, pondweeds, smartweeds, and others. Snails, bivalves, insects, crustaceans, and other animal matter may also be important in their diet at some seasons. Pheasants sometimes lay eggs in blue-winged teal nests. Incubation is by females only in about 23-24 days. Young leave their nests within 24 hours after hatching, find their own food, and are tended by females for the first few weeks, but broods of young are often left alone before they are old enough to fly. Young are capable of flight in about 38-49 days after hatching. migration. Males have varied courtship displays, including one in which whole forepart of their body is submerged, tail raised, and feet waved in the air. Nest sites are on ground in prairie, hayfield, coastal meadow, and sometimes several hundred yards from the nearest water. Nests are a shallow depression with some grass or weeds added, lined with down; usually well concealed by surrounding vegetation. I spotted a couple of this handsome duck species during a scheduled bird walk at the Tijuana Estuary. They are conducted free on the first and third Sunday of each month from 3PM to 4PM. Plan to join the small guided group there to learn some bird facts from their terrific volunteer docents.